Clutch Baseball társasjáték - Magyarország társasjáték keresője! A társasjáték érték! A Clutch Baseball egy remek társasjáték, 2 játékos részére, az átlagos játékidő rövidebb, csak 30 - 60 perc. A társast, 13 éves kortól ajánljuk kipróbálni. A játékmenet erősen épít a szimuláció és a kockadobás mechanizmusokra. This is Clutch Baseball–an exciting, fast-paced fantasy game. Build a team, craft the perfect strategy deck, and choose a home stadium. The quest for the perfect deck starts here. Create a team based on a set salary cap, choose strategy cards that will solidify their strengths, and select the stadium that will give you an unbeatable home field advantage. Every at bat includes two basic elements–the Pitch & Swing. To keep it simple: the Pitch determines who will get the advantage in the at bat, and the Swing determines the result of the at bat. 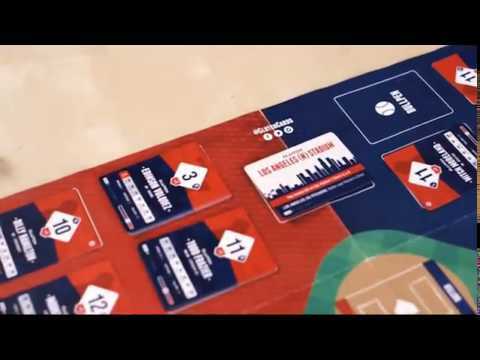 The game is played and scored just like traditional baseball using player cards that are Batters and Pitchers from real big league teams with suitable stats on a playmat resembling a baseball field. Play a full game (9 innings) consisting of 3 outs per ½ inning, with the Away Manager batting in the top half of the inning. As you send each batter card up to the plate, there is a pitch roll and a swing roll to determine the result (out, walk, hit, home run, etc). Batter cards move around the bases to score runs like in real baseball. The game ends after 9 innings with the team that scored more runs being the winner - in the event of a tie you go to extra innings until one team comes out ahead! Strategy cards played at different times give bonuses or allow you to make real baseball plays like hit-and-run, defensive shifts or even a suicide squeeze. You can use pinch hitters and runners, make pitching changes and other real baseball decisions.